OKLAHOMA CITY — Well, no one saw anything like this coming. And no, this has nothing to do with the Thunder taking apart Sacramento on Sunday night, 108-93. We all saw that coming. No biggie there. This was a week that’s worth remembering. One Kevin Durant, Scott Brooks or any other member of the team can look back at for anything from inspiration to motivation. A week ago, the Thunder messed around with Milwaukee and ended up winning a home game. They didn’t look great, they look just good enough. Then the Thunder lost a lead at Memphis and lost the game. Then they lost their way in the first half against Houston. Since then, it looks like OKC has figured it out. They rallied for a win, thanks to its defense against Houston, then used its offense to beat Golden State. Sunday, it was a bit of both. Because of it all, the Thunder improved to 31-10 and seemingly have settled themselves from what was a 5-5 stretch. "If you judge your performance game to game it could be a roller coaster for every team," Brooks said. "If you focus on what you do, the roller coaster isn’t what people make it out to be. We’re always the same." 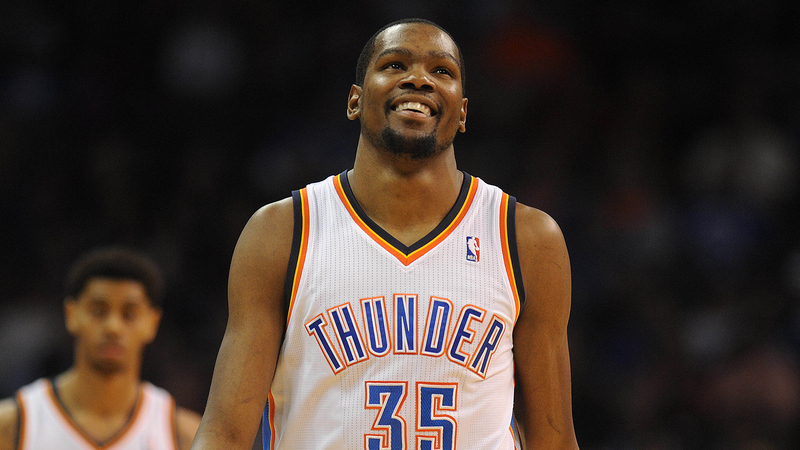 Sunday against Sacramento, Kevin Durant scored 30 points on 10-of-15 shooting. He’s scored 30 or more points seven games in a row and is 29-of-43 in the past two games. Durant scored a career-high 54 points against Golden State and is leading the NBA in scoring at more than 30 points per game. "KD is a special player," said coach Scott Brooks in what leads the league this season in the category of most-understated quote. "I like the way he thinks. He thinks about the team. He took 15 great shots. He’s not looking to score every time that’s what I love about what he brings to this team." Durant scores his 30 points, but he had a team-high nine assists, too. That’s 22 assists the past three games. What Durant does is score when he has to (like against Golden State) and facilitates when he needs to (like against Sacramento). It’s been a great week for Durant. 9-of-13 shooting Sunday for 20 points, 8-for-11 against Golden State for 21 and 10-of-13 against Houston for 21. When the Thunder needed help, Ibaka showed up. That’s 27-of-37 in the past three games to go along with 29 rebounds and seven blocked shots. "He’s a developing offensive player," Brooks said. "I think he’s improved, not only making shots, but also knowing how to play and knowing where to be so hue can have a cleaner look . Like I tell him, his impact has to be a defensive impact and that yeps the scoring." Kind of gets old saying Kevin Durant and Russell Westbrook need help, but Ibaka is the best bet to provide it. He’s definitely played better this season, both defensively and offensively. 3. Did you see what Kendrick Perkins did? Yeah, I’m talking about that half-court shot he threw up Sunday against Sacramento that — for a second — sure looked like it was going in. Alas, much like many of his shots, it was a bit too strong. In a January matchup against a dud team like the Kings, the Perkins’ shot breathed a little life into a game that was pretty forgettable. But beyond Perkins and his shooting touch, the Thunder center had a really great week. He’s averaging just 3.3 points and 4.6 rebounds, but Perkins had seven rebounds against the Kings, 12 against Golden State and eight against the Rockets. Perkins even made three-of-seven free throws Sunday night when Sacramento got the bright idea to start fouling him in the final minutes. Meanwhile, Perkins played inspired defense against Dwight Howard for the second time this season — both Thunder wins. Perkins isn’t in there to score. We know that. He’s not in there to do much, actually, but when he matches up with Howard and some of the top big men in the league, Perkins shows up.